We work with businesses, organizations and public entities every day to help them prepare for, and respond to, catastrophic events. But no matter the amount of preparation or the adequacy of planning, the human toll always exceeds everyone’s imagination. The number of deaths related to the recent storms is staggering, as is the number of people injured or displaced. Even for those fortunate enough to only sustain minor damage, the impact to the rest of their community is so severe that almost everyone in the storms’ path is suffering to some extent. The most heart-wrenching stories often involve those very citizens who were in need of care even before the storm – our seniors, those with disabilities, the sick. The challenges they face are amplified following an event like Michael. For example, moving an Alzheimer’s patient simply to another corridor is disruptive; moving them to another facility is incredibly difficult and painful for the patient, who relies on stability, structure and routine. In our niche consulting role, we are called upon to do our job unemotionally, which often requires us to remain detached from the human element that surrounds us. But we are not totally immune - we feel the pain of those suffering around us, even as we try to focus our efforts on assisting in the recovery. However, we also get to experience the greatest in humanity following a disaster. The outpouring of support and overwhelming response from the community itself, and beyond, refocuses attention on recovery and resiliency. The human spirit shines as bright as ever. We see firsthand that spirit in doctors and nurses tending to the injured, in emergency responders answering the call while the winds are still blowing, in neighbors and friends checking-in on each other and reporting to families across the country about the safety of lo ved ones. Selflessness abounds. Communities grow ever closer after a disaster; bonds are formed or strengthened forever as people truly recognize that no person is an island. And when the worst news unfortunately arrives, those bonds may be the only means of survival. 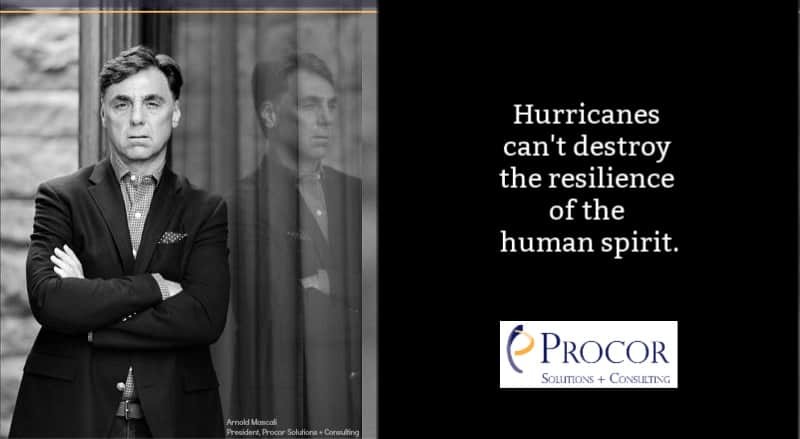 At Procor, we are proud of the people we serve – and are humbled at the resilience we witness everyday. And we reflect on that resiliency and think about ways we can help others in the future.